New Supreme Court Judge, Justice Shanthi Eva Wanasundera commenced her primary education at St.Thomas' Girl's School Matara and proceeded to Dharmapala Vidyalaya Pannipitiya, where she excelled both in academic and extra curricular activities. In recognition of her excellence as a student, she was bestowed the singular honour of being appointed the first female Head Prefect of Dharmapala Vidyalaya, Pannipitiya. This perhaps was a precursor to the many firsts Justice Eva Wanasundera was destined to achieve in her career, said Attorney General , President's Counsel Sarath Palitha Fernando at the ceremonial sitting to welcome new Supreme Court Judge, Justice Eva Wanasundera recently. "Whilst still at school, Justice Wanasundera was awarded an American Field Service Scholarship which enabled her to proceed to the United States of America and spend one year as an exchange student. "During this period, Justice Wanasundera graduated from the High School of Arizona, prior to commencing legal education at the Sri Lanka Law College. Among Justice Wanasundera's academic achievements is a Master Degree in Law from the University of Leicester, UK in1995," the Attorney General added. Justice Wanasundera was called to the Bar in 1997 and practiced at the Unofficial Bar for two years prior joining the Attorney General's Department where she served with distinction before being elevated as a Judge of the Supreme Court. "During the tenure at the Attorney General's Department, Justice Wanasundera discharged her duties displaying a high degree of professionalism and competence. As Attorney General, she served the government with honesty, sincerity and unwavering firmness in keeping with the highest professional and ethical standards up holding the worthy traditions of the Official Bar," he said. The Attorney General emphasised that Justice Eva Wanasundera's career record at the Attorney General's Department is decorated with many firsts of which anyone can be justifiably proud. "Justice Wanasundera had the singular honour of being appointed the first woman Senior State Counsel, the first woman Deputy Solicitor General, the first woman Additional Solicitor General and the first woman Solicitor General. Incidentally Justice Weanasundera was the second woman officer to be recruited to the Department as State Counsel while the first woman State Counsel was Justice Shirani Thilakawardena, who accompanies Justice Eva Wanasundera on the Bench at today's ceremony. This series of firsts later culminated in Justice Wanasundera creating history when she became the first woman to be appointed Attorney General in the 127 year long history of the Attorney Gneral's Department of Sri Lanka" the Attorney General said. As Justice Wanasundera takes over the rightful place in the apex Court of this country" I though it appropriate to quote from the Dharmishta Wagga of the Dhamma Padha on the role of a Judge as we are well aware that Justice Wanasundera follows the teaching of Buddha, with devotion, as a guiding light in both her professional and personal life. I am rading Verse 256 of the Dharmishta Wagga.---- The English meaning of this Verse is that "a man is not a just Judge merely because he aritrates cases hastily withou proper care. A wise Judge would investigate and give his decisions without being partial." A judge cannot dispense justice without the necessary support of those entrusted with the task of preserving the sanctity of judicial system. "The Bar is as important as the bench in the administration of justice and misunderstanding between the Bar and the Bench are regrettable for they prevent the attainment of which all of us desire, namely that justice should not only be done but should appear to have been done." As stated by Lord Sankey, both the Bench and the Bar are single minded in their quest. Therefore, while felicitating the appointment of Justice Eva Wanasundera as a Judge of the Supreme Court. 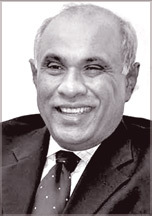 "I consider this an opportune moment to reassure Justice Wanasundera's of the renewed commitment of the Bar to the cause of justice and the upholding of the independence of the judiciary, the Attorney General said "We are mindful that the challenges faced by the Judiciary in the dispensation of justice are as great as they were ever before. We the members of the Bar assure Justice Wanasundera of our unwavering and total stinted support in the endeavours of Justice Wanasundera's to sustain and uphold the Rule of Law," the Attorney General added.